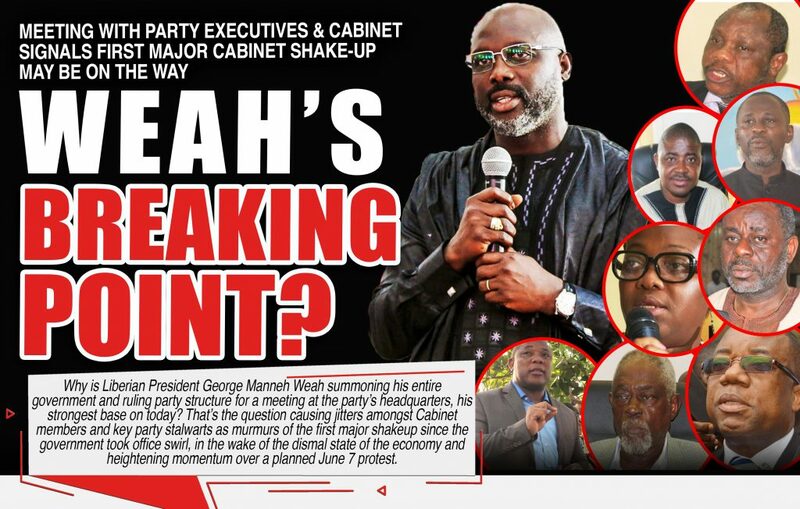 WASHINGTON – Why is Liberian President George Manneh Weah summoning his entire government and ruling party structure for a meeting at the party’s headquarters, his strongest base on Monday? That’s the question causing jitters amongst Cabinet officials and key party stalwarts as murmurs of the first major shakeup since the government took office swirl, in the wake of the dismal state of the economy and heightening momentum over a planned June 7 protest. Party chairman Mulbah Morlu in a statement Saturday, invited members of the ruling coalition which includes collaborating parties and members of the Cabinet to a meeting to be presided over by the President at 4pm. The meeting, according to some party officials and government insiders, will dwell on pertinent governance issues and shortcomings in the rule of law. The President has asked members of the Coalition Governing Council; the Coalition Executive Committee; Executive Committees & Members of collaborating political parties, members of the Cabinet, the Montserrado Chapter of the Coalition for Democratic Change, the Coalition’s Revolutionary Nat’l Youth League, the coalition’s women league, the National Coordinator’s Council & Zonal Heads of the Coalition for Democratic Change, Standing & ad-hoc Committees of the Coalition for Democratic Change, the Coalition’s Nat’l Auxiliaries Network, the Coalition’s Disable-League, members, Sympathizers & Supporters of the Coalition for Democratic Change. Multiple sources within the administration have confirmed to FrontPageAfrica that the top agenda items will likely include the dismal state of the economy, countering a planned June 7 protest and consultations over a long-anticipated shake-up of the government. “The President is looking to hear from his partisans and gauge their response on a number of issues. As you know this will be the President’s first major meeting at the party headquarters since he won. Bringing the governing council and Cabinet signals how seriously he is taking what is unfolding in the country,” the source noted. Chatters of a major shake-up has been in the air for months since noticeable decline in the economy began to emerge. More than a year on, signs of economic strains are increasing as the foreign exchange rate continues to rise and price of basic commodities hit all-time highs. Complicating matters, a planned protest in the works for June 7 has caught the attention of the government with at least one government insider acknowledging on condition of anonymity Sunday, because he is not allow to speak on the record, at the weekend, that the president and the administration are concerned about making adjustments in a bid to calm the nerves of critics and the opposition. Even as the administration appear reluctantly to be given the protesters the greenlight, the response has been cautious. Mr. Nathaniel McGill Minister of State for Presidential Affairs told FPA at the weekend that the government will allow Liberians planning to protest on June 7, 2019 to go ahead with said protest because according to him Protest is guarantee by the constitution of Liberia. The minister said while it is true that the constitution guarantees the right of all Liberian to protest, the government is also charge with the responsibility to protect the Peace of Liberians, and the protection of lives and properties. Minister McGill warned that heads of these protesters will be held accountable for any violence. “The right for people to protest is guarantee by the constitution of Liberia since we came into existence as a government, we have protected people to protests and we will continue to protect people rights to protest. While many political pundits have been speculating a major shake-up for quite some time, skeptics have had some reservation raising doubts that President Weah could pull the trigger on some of his key lieutenants as pressure mounts on his administration to begin clamping down on corruption and making recognizable gains on the governance front. More than a year in the administration’s first term however, mounting concerns from international stakeholders are raising cause for alarm. The government’s delegation to last week’s annual spring meeting of the World Bank concluded with mixed reviews amid dire economic circumstances. Under Weah, Liberia’s fiscal stance has come under scrutiny with both the World Bank and the IMF cautioning against overspending and decreased revenues collection. All this as tens of millions of dollars have been borrowed from the Central Bank of Liberia (CBL) with slow or non-payment from the government. Despite warnings from the IMF in their last Article IV consultation in March, the government continues to spend more money than it collects. The government’s inability to make the necessary adjustments has prompted international stakeholders and development partners including the World Bank, the IMF and the Norwegian government has prompted donors to ask burning questions as to why their funds have been used to pay some government’s recurrent expenditure and not the purpose intended. International partners have also expressed concerns that a large amount of Liberian dollars is close to non-existent in the banking system, with estimates ranging from 20-25 billion dollars. At the same time, only 1.2 billion dollars are said to be in the banks. Despite banks showing capital adequacy, with most of their assets in loans to the private sector, yet there is operational illiquidity with banks having challenges to pay customers, resulting into delays. Small amounts like $5,000 are split up and customers are routinely told to make two or three trips to fulfil their withdrawals or encashment of checks. At last week’s World Bank Spring Meeting in Washington, Finance and Economic Affairs Minister Samuel Tweah and delegation sought the bank’s backing for the implementation of its ‘Pro-poor Agenda for Prosperity and Development’ (PADP), the government’s national development agenda for the next few years of its term in office. The minister, during discussions raised issues such as investment in private sector, domestic revenue mobilization, digital economy and social safety net, which are in line of the PAPD, placed before the donor partners for consideration. But despite the plea, authorities at the Finance Ministry disclosed: “The World Bank had already earmarked US$106 for three key sectors, including education — US$50M, water and sewer — US$30M, and Public Financial Management — US$26M.” However, the Liberian Government would have to develop a logical framework and a rationalized time bound matrix for the utilization of this money. All this as the IMF appears reluctant to give Liberia a favorable response to its request for its financing programs which provides member countries the breathing room, they need to correct balance of payments problems. FPA has learned that an IMF mission is heading to Liberia in May or June to assess Liberia’s macroeconomic position, mainly balance of payments and fiscal position. The delegation will reportedly demand a review all GoL’s fiscal and monetary records after which they will propose appropriate prescriptions for negations. The board will have to approve before a final decision is made on Liberia’s request. An unfavorable response could prevent Liberia from being eligible for quick loans and quick fixes, a decision which could signal the start of a rather difficult road ahead for the George Weah-led government. For President Weah, questions and concerns from international stakeholders are strong enough reasons – even for a President whose supporters feel is immune from criticisms and above reproach, to explore making adjustments. Washington, listed Liberia among Sub-Saharan African countries, scoring the lowest of all the world’s regions on the World Bank’s Human Capital Index, a measurement of how well countries invest in the next generation of workers. The score is explained by high mortality and stunting rates in the region, as well as inadequate student learning outcomes – all of which have a direct effect on economic productivity. In an effort to help countries turn these indicators around, the World Bank’s Africa Human Capital Plan is setting ambitious targets to be achieved in the region by 2023. These include a drastic reduction in child mortality to save 4 million lives, averting stunting among 11 million children, and increasing learning outcomes for girls and boys in school by 20%. These achievements can raise Africa’s Human Capital Index score upwards to increase the productivity of future workers by 13%. “Preventing a child from fulfilling his or her potential is not only fundamentally unjust, but it also limits the growth potential of economies whose future workers are held back. GDP per worker in Sub-Saharan Africa could be 2.5 times higher if everyone were healthy and enjoyed a good education from pre-school to secondary school,” says World Bank Vice President for Africa Hafez Ghanem at the launch of the Bank’s Plan during the World Bank-IMF Spring Meetings. The World Bank is already supporting countries like Liberia to come up with new strategies to invest more and better in their people. Twenty-three African countries, covering over 60% of the region’s population, have joined a coalition of nearly 60 countries to join the Human Capital Project, committing to a set of accelerated investments in their human capital. “Human Capital Project countries are breaking away from traditional paradigms to make investment in their people a priority and are working in a more coordinated way across government to ensure that households have the right enabling environment to support human capital formation,” said Annette Dixon, World Bank Vice President for Human Development. With President Weah and his ruling party fast approaching the half-way point of its second year in office, the clock is ticking on the administration to deliver. But many political and diplomatic watchers say, adjustments would be key to gauging success and failure. In the final analysis, how the rest of the second-year shape out; would go a long way in deciphering how stakeholders rethink their early assessments and gauge of the Weah-led government as it limps toward the end of its second year in office.